Contemporary steakhouse at Sam's Town Hotel & Gambling Hall. 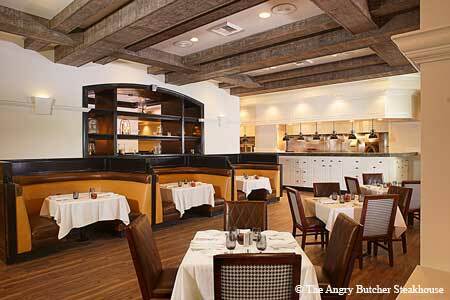 : The Angry Butcher Steakhouse is located at Sam's Town Hotel & Gambling Hall within the Mystic Falls Park atrium. The restaurant's décor includes a high-contrast neutral color scheme, a collection of bric-a-brac, upholstered private booths, hand-finished ceiling beams, a walnut plank floor and an open kitchen. To eat, there's deep-fried oysters served in the shell with vinegar slaw; beefsteak tomato salad topped with basil and aged balsamic vinegar; French onion soup with sherry wine; Pacific salmon and North Atlantic halibut; signature cuts, including prime rib on or off the bone, New York steak, bone-in rib-eye and pan-roasted USDA Prime flat-iron steak; and desserts such as warm bread pudding and chocolate espresso layer cake.